Tiger Shark (Species Profile) - We Love Sharks! Tiger Shark (Species Profile) - We Love Sharks! The tiger shark (Galeocerdo cuvier) is one of nature’s largest sharks. It is found in many tropical and temperate regions of the world’s oceans, and is especially common around islands in the central Pacific. The tiger shark hunts alone, usually at night. Its name is derived from the dark stripes down its body, which fade as the shark matures. Galeocerdo cuvier is the official globally accepted scientific name of the tiger shark that is also sometimes referred to as the Sea Tiger. Other scientific names have been used to refer to the same species including Squalus cuvier and Galeocerdo tigrinus. It has a cartilaginous skeleton and is therefore a member of the class Chondrichthyes. It is a member of the Requiem Shark family which also includes common shark species such as the bull shark and the blue shark. They are the largest under the order Carcharhiniformes and the presence of a nictating membrane over the eyes being the key distinguishing feature from the Mackerel Shark family. The tiger shark is believed to be a direct descendant of the extinct shark species known as Galeocerdo latidens. The serrated teach on these fossils were the main feature used to establish a relationship between the two. The fossils from these species date back more than thirty million years. This means that tiger sharks have roots going back as far back in history as the Eocene period. As with most shark species, tiger sharks exhibit sexual dimorphism. This is where females are considerably larger than male counterparts of the same age. The length of female tiger sharks ranges from 4.25 m to 5 m whereas that of males ranges between 3.25 m and 4 m. Both can weigh between 385 and 635 kg with pregnant females being known to weigh up to 1200kg and more. The Tiger Shark receives its name from the distinct tiger-like stripes and spots on the skin of young specimen. These fade with age giving rise to the predatory countershading skin feature with a darker upper half and a lighter lower half. This shark species also has some very interesting sensory features. These include electrosensitive pits above the snout and a lateral line along the trunk that detect electric impulses and vibrations from prey respectively. The Tiger Shark is a predator and is believed to have the widest prey range of any other predator shark. This means that it can eat anything from small fish and sea snakes to dolphins and other small sharks. Some have even been known to exhibit cannibalistic tendencies by feeding on rival Tiger sharks. With smaller prey, the meal is swallowed whole without biting or chewing. However, with larger prey the sharks tear off and swallow chunks of flesh progressively until the meal is complete. Their excellent eyesight at low light intensity as well as the special sensors allows it to do most of its hunting at night. This increases the success rate allowing them to feed several times within a month. 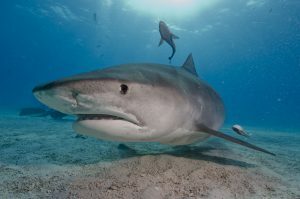 Finally, Tiger Sharks have a tendency to eat pretty much anything that they come across and have been found with inanimate objects including rocks, shoes and even plastic bottles in their stomach. This is why they are sometimes referred to as the garbage eaters of the sea. Tiger Sharks are ovoviviparous. This means that the females carry eggs which hatch within them allowing birth of live pups. Mating takes place seasonally based on the shark’s location. Those in the northern hemisphere mate between March and May whereas those in the south prefer November and December when the waters are warm. Once the eggs are fertilized, the female carries them for a gestation period ranging from 14 to 18 months. The eggs hatch and 10-80 pups are released. Tiger sharks are drawn to warm water and are therefore mainly found in the tropical, subtropical and peri-equitorial regions. They are also known to prefer deeper waters and only brave the shallows when in search of prey. Tiger sharks have a life expectancy of up to 12 years, with some living longer and the majority dying at a younger age. Due to their nomadic nature and their love for deep waters, it is difficult to determine the population of Tiger Sharks. However, the fact that they are constantly being poached for their meat, fat and fins has landed them the near threatened list. As far as unprovoked shark attacks are concerned, Tiger sharks are the second most prolific culprits second only to the great white sharks. The attacks usually occur when humans swim in the path of pregnant females migrating in search of birthing sites. Fortunately, the bites are rarely fatal as the sharks tend to let go as soon as they bite.